Directed by Brian de Palma and screenplay by David Koepp from a story by de Palma and Koepp, Snake Eyes is the story of a police detective who attends a boxing match with a friend where an assassination takes place with everyone being a suspect. The film is a suspense-thriller that plays into a man dealing with his surroundings as well as wondering if what he claims to see really happened. Starring Nicolas Cage, Gary Sinise, Carla Gugino, John Heard, Stan Shaw, and Kevin Dunn. Snake Eyes is a complex and mesmerizing film from Brian de Palma. Set in Atlantic City on a rainy night where a major boxing fight is to occur in a hotel/casino before it’s to be torn down, an assassination of a defense secretary happens where a corrupt police detective was sitting in front of the man as he notices something is off as he and a friend find out what’s going on. It’s a film that plays into conspiracy theories over this assassination and who is involved and why where this crooked detective in Rick Santoro (Nicolas Cage) is there just to see a fight only to suddenly having to work where he would realize that this wasn’t a typical assassination. David Koepp’s screenplay takes this simple premise of an investigation into this assassination where everyone is a suspect including this woman named Julia Costello (Carla Gugino) who was talking the defense secretary Charles Kirkland (Joel Fabiani) just as he was shot while she would also get a wound in her left arm. With his friend Commander Kevin Dunne (Gary Sinise) also investigating as he was Kirkland’s bodyguard who had suspected a woman in red named Serena (Jayne Heitmeyer) for being there without a ticket to the fight. Santoro would notice little things that are suspicious such as the fight as well as some of the people watching it which play into his need to find truth. Though Santoro is a flawed individual as he admittedly takes bribes and always gamble as well as being despicable at times. Still, he is a man that is willing to do his job as he would later deal with the fact that something isn’t right as the script does reveal a key twist during its second act with everything coming ahead for its third as Koepp maintains a sense of intrigue but also motivations into why this defense secretary is killed. Brian de Palma’s direction is definitely stylish with its intricate tracking shots, crane shots, and all sorts of things which is often expected from de Palma. Notably the way he opens the film with this 12-minute continuous tracking shot with some invisible cuts that play into Santoro and his wild persona as the first thing shown is a newscaster (Tamara Tunie) on TV reporting outside of the casino as a major storm is happening and it then the camera pans to another TV screen where another reporter in Lou Logan (Kevin Dunn) is covering the fight and then the camera pans to Logan being filmed with Santoro walking behind him. This intricate shot showcases so much in the wide and medium shots as well as de Palma establishing what is happening and where Santoro is going he is also talking on the phone to his wife and a mistress as well as other people before sitting with Commander Dunne who would leave to deal with the woman in red where Julia would take Dunne’s seat to talk to Kirkland with nothing on the fight shot during this 12-minute sequence. The film would then become this suspense-thriller that showcases the event of the assassination as well as what was happening in the fight as well what was Commander Dunne doing and what Julie was talking to Kirkland about before he died. These different point-of-views happen early in the second act as well as the twist which definitely show that there is something going on as de Palma uses this reveal to show a much bigger picture. Even as Julia becomes a target as she knows who might’ve planned the assassination yet isn’t able to identify the person because she can’t really see anything without glasses. These little details that include this intricate crane-tracking shot of the hotel rooms from above is among some of de Palma’s finest moments in playing up the suspense. The film’s climax play into not just the reveal of who planned the assassination and why but also the fact that there’s many people involved that someone as corrupt and troubled as Santoro would be likely to take whatever money is offered to not get involved. Yet, de Palma knows that even those who aren’t perfect and corrupt couldn’t exactly walk away from doing the right thing no matter how bad things can be. Overall, de Palma creates a wild yet gripping film about a detective figuring out who killed a man at a boxing match. Cinematographer Stephen H. Burum does brilliant work with the film’s cinematography in its usage of lights and soft focuses as well as create an atmosphere for many of the interiors including the hotel rooms, the casino, and the arena where the boxing match takes place. Editor Bill Pankow does excellent work with the editing with its usage of stylish invisible cuts, jump-cuts, split-screens, and fade-outs to play into the suspense that looms throughout the film. Production designer Anne Pritchard, with set decorator Daniel Carpentier plus art directors James Fox, Isabelle Guay, and Real Proulx, does amazing work with the look of the hotel rooms, the room of the boxer, and parts of the arena as well as some of the exteriors of the hotel/casino. Costume designer Odette Gadoury does terrific work with the costumes from the wild suit that Santoro wears for the fight to the stylish clothes some of the characters wear in the film. Special effects supervisor Garry Elmendorf and visual effect supervisor Eric Brevig do fantastic work with some of the visual effects as it relates to the stormy weather for the film’s exterior including its climax. Sound editors Richard P. Cirincione and Maurice Schell do superb work with the sound in creating sound effects for the fight heard off screen as well as the chaos in the arena that relates to the crowd and gunfire. The film’s music by Ryuichi Sakamoto is wonderful for its orchestral score that play into the suspense with its string arrangements as well as bombastic pieces to play into the intensity of the reveals and other moments in the film. The casting by Mary Colquhoun is marvelous as it feature some notable small roles from Adam C. Flores as the challenging boxer Jose Pacific Ruiz, Eric Hoziel as the shooter Tariq Rabat, James Whelan as the mayor of Atlantic City, Chip Chupika as the drunk in the audience, Jayne Heitmeyer as the woman in red named Serena, Chip Zien as Tyler’s manager, Michael Rispoli as Tyler’s agent, Tamara Tunie as the reporter Anthea, Peter McRobbie as a FBI official, Mike Starr as the casino security head Walt McGahn who helps Santoro, David Michael Higgins as a man Julia seduces into his hotel room so she can hide, and Luis Guzman as a friend of Tyler in Cyrus whom Santoro beats up over money which he uses to gamble. Kevin Dunn is superb as the fight reporter Lou Logan as a friend of Santoro who is eager to get a break while would help Santoro reveal some things that Logan’s crew filmed. John Heard is fantastic as the hotel/casino owner Gilbert Powell who is believed to be part of the conspiracy as a way to get money for the new hotel he wants to create. Joel Fabiani is terrific as the defense secretary Charles Kirkland as the target of this assassination as a man who has the power to do something yet is unaware of what he will do as there are those that want him dead. Stan Shaw is excellent as the boxing champion Lincoln Tyler as a man who is believed to be part of the conspiracy as Santoro suspects his involvement where he is revealed to be a flawed man that is dealing with all sorts of problems. Carla Gugino is brilliant as Julia Costello as a woman working in the defense department as she has uncovered some things that would harm a program as she also becomes a target forcing Santoro to protect her. Gary Sinise is amazing as Commander Kevin Dunne as Santoro’s best friend as a man that is assigned to protect Kirkland only to botch it as he copes with his shortcomings as well as become intent in uncovering the conspiracy. Finally, there’s Nicolas Cage in an incredible performance as Rick Santoro as a corrupt detective who attends the fight as a spectator only to see something is off as he does whatever he can to find out the truth only to cope with some major revelations as he becomes conflicted into doing what is right as well as loyalty. 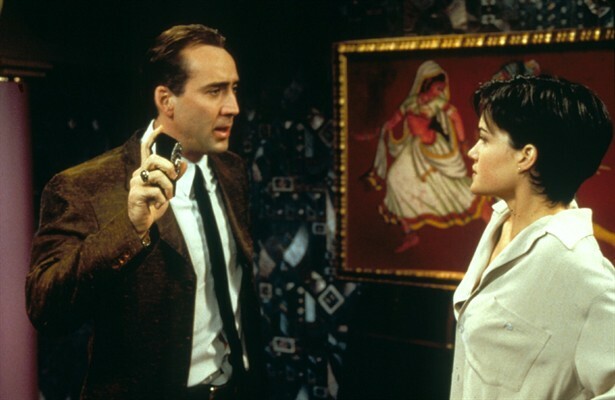 Snake Eyes is a remarkable film from Brian de Palma that features a wild and fun performance from Nicolas Cage. Along with its supporting cast, complex twists and turns, dazzling visuals, and Ryuichi Sakamoto’s haunting score, it’s a film that bears a lot of the fun elements expected in a suspense thriller while also being this intriguing study of conspiracy and two men trying to uncover the truth with a woman being targeted for carrying the truth. In the end, Snake Eyes is a marvelous film from Brian de Palma. HELL YES! I'm so happy when I find other fans of this film. I know many consider it "lesser De Palma," but I've always loved it. Cage is a perfect balance of Serious Cage and Unhinged Cage. Great stuff. @Alex-I'll take a lesser de Palma film over anything else. I always enjoyed the film for its complexities and Nic Cage being crazy and serious. This was a fun film and it still holds up.